When I do street photography, I mostly do just street photography. This I guess is not what most people do. Many will simply want a small camera on their person to take advantage of scenes that open up before them. After which they will go about their business. I mostly prefer taking my DSLR, but very occasionally this is just not suitable. Which compact street photography camera? I use two basic small compact cameras occasionally for street photography. Firstly a Canon G12 and secondly a Nikon P300. Each has their strengths and their weaknesses. It is at this point that the different issues becomes helpful for you to decide which camera you would be happy with. The list of issues are meaningful even if neither the Canon G12 nor Nikon P300 are your street photography camera of choice. The Canon G series of cameras are good. 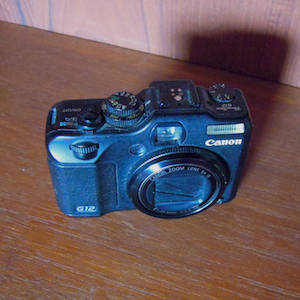 My first digital camera was a Canon G3 (4mp) almost 15 years ago. They offer more ergonomic control; compared with most compact cameras; with excellent black and white, exposure compensation, ISO dial, user presets, and an optical viewfinder as well as a tilty flippy screen. These things can make the difference in getting or missing the shot. Kai while at DigitalRevTV did a review video, with typical sarcasm and wit. He points out the added features of a built in 3 stop ND Filter and a maximum shutter speed of 1/4000, both also valuable for street in certain circumstances. I just love the black and white coming from this camera using the standard settings. It has a character that feels real. For this reason I think it makes an excellent street photography camera for those that try to get images right in camera. Examples can be found in my Burghausen Video. With street photography there is often too little time to press buttons, rotate scroll dials and finally confirm the setting to get settings correct for a picture. However in the street, light changes quickly and buildings and people create far greater contrasts that need to be corrected for. Fast manual interference or influence is often essential if the images are going to be usable. The Canon G12 has two user presets which allows for pre-configuring the image ratio, colour or black and white, the vivid settings, the default zoom position and so on. I take images that are black and white or colour depending on the scene before me. In addition I like to have a 1:1 image ratio for my black and white photography. Again this is a valuable “quick ready” option to capture the scene without the finger fumbling that so many digital menu systems require. Clearly the screens are getting better, but my eyes are not. So I find the optical viewfinder a god send when it comes to harsh light, composition and speed. In addition the battery life is spared from the juice hungry “billboard” sported by so many compact cameras today. I could not live without some optical viewfinder to cope with some of the moments I want to capture. The flip out screen on the Canon G12 has opened up many an image that would otherwise be lost. The opportunities are diverse, from over the heads of large crowds, low and from a child’s perspective or from the “gut” more in line with medium format cameras of old. Whilst light and general composition play a significant role in the interest of images, so does the “altitude” of the shot. Perspectives change when the altitude of the camera changes and this can lead to a difference in composition that is significant. Positioning can make a rather plain scene suddenly acquire a foreground. Be it a cigarette end, a beer can or the face of a dog! With the ergonomics, relatively small size and the 3648 × 2736 resolution this is a very usable camera for travel, street as well as occasional photography. It is built well and feels solid in the hands. 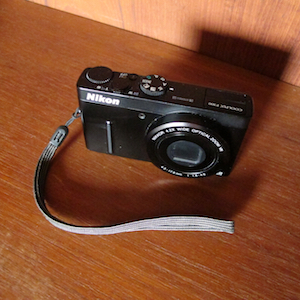 This camera was purchased second hand about 8 years ago (2009) for UKP 250. Today they are likely to be much cheaper. Newer G series have larger sensors and other benefits, check the information on Wikipedia. The Nikon P300 by contrast has a very unergonomic interface, but has the benefit of a fast lens, far more compact size and a zoom that goes wider than most. Kai while at DigitalRevTV did a review video, but he considered the Bokeh aspects of a fast lens. Ironically he compared it to the Canon S95 which is very similar to the G12. Sometimes we need to push a street photography camera to extremes, and more often than not because of reduced light. This lens can push to f 1.8 when at its widest. This whilst not suitable for Bokeh does allow for decent exposure in lower light conditions, such as dark alleys or covered doorways. This gives the P300 an edge when compared with most compacts. The G12 only going to f 2.8. Remember though that the sensor size also has significant impact on low light images. But normally a larger sensor then increases the size of the camera. The camera is small. The solid feel and the smooth black paint make slipping it into a pocket a doddle. The dials are virtually flush with the body, so create no great obstacle for putting or getting the camera to or from the pocket. The flush fittings also means that little leverage is placed on them causing them to break over time. The small size may cause a problem for those with larger hands, but the lack of “touch screen” means the right thumb can easily go over the screen to avoid pressing the fiddly buttons. This camera has a 24mm equivalent focal length at the widest end and zooms to 100mm equivalent. The wide makes for interesting opportunities that can make a difference in a tight spot. We have used this at corporate casino events to capture game play embedded within crowds of gamblers. The size combined with fast aperture and zoom is most suitable. Whilst this example is not street photography, the crowds and difficulty in using ones feet to reframe a fixed focal length camera are the same! With a respectable 4000×3000 resolution and a 24mm equivalent focal length at its widest, this camera can hold its own in getting shots that other compacts typically can’t. There is room to edit and it slips in the pocket like a smooth packet of cigarettes, albeit pregnant with the lens jutting out. This camera was purchased second hand about 2 years ago (2015-16) for €69. Today they are likely to be much cheaper. There are other P Series cameras but they seem to be very different in their advantages, check the information on Wikipedia. Both have their place and are suitable for different conditions. In low light or tight spots the P300 is great. For the more normal conditions of street photography, the optical viewfinder in sunlight and the positioning aspects possible with the screen the G12 is my camera of choice. I hope that the issues that I raise here help you choose a camera that meets your needs, but don’t forget that older is cheaper and this allows a little experimentation without the hit on the purse that latest kit often incurs.